Mictlantecuhtli back to back with Quetzalcoatl, based on the Codex Borgia, detail. Mictlán is the underworld of the Nahua People (also known as the Aztec, and sometimes as the Mexica Tribe), ruled over by its Lord and Lady. It is a gloomy place, reached by the dead only after wandering for four years beneath the Earth, accompanied by a “soul-companion,” a dog which was customarily cremated with the corpse. Aztec myth tells how the deity Quetzalcoatl, who in the Nahuatl language means “feathered serpent,” journeyed to Mictlán at the dawning of the Fifth Sun (the present world era), in order to restore humankind to life from the bones of those who had lived in previous eras. For bones are like seeds: everything that dies goes into the Earth, and from it new life is born in the sacred cycle of existence. 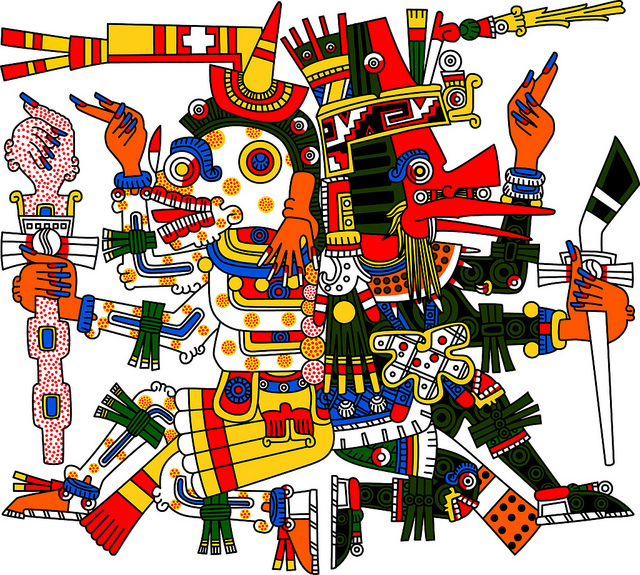 Xolotl led the way down to Mictlán and through the nine layers of the Realm of Death. They retraced the path that the Sun took every night down into the depths of the underworld, all the way to the palace of the Lord of the Dead. “We must be careful,” Quetzalcoatl said. “I know Lord Mictlantecuhtli will not be pleased by our request. He is a wily god and may try to trap us.” Xolotl agreed, and they cautiously proceeded to the throne of the Lord and Lady of the Dead. Lord Mictlantecuhtli, god of the dead and the king of Mictlan, often depicted with his skeletal jaw open to receive the stars that descend into him during the daytime. From Pink Lady Makeup Artist. Lady Mictlancihuatl looked pleased by these words. Lord Mictlantecuhtli considered them, then spoke. “Hmmm. An interesting idea. All right. You can have the bones…” Xolotl began to move towards the bones. “IF” continued Mictlantecuhtli. and Xolotl froze. “IF you can play my conch-shell trumpet and circle my kingdom four times in honor of me.” He handed Quetzalcoatl a conch shell that with no finger holes did not look like any kind of instrument. They left the chamber. To the Aztecs, Quetzalcoatl was a feathered serpent, a flying reptile, who was a boundary-maker (and transgressor) between Earth and sky. He was a creator deity having contributed essentially to the creation of Mankind, related to gods of the wind, of the planet Venus, of the dawn, of merchants and of arts, crafts and knowledge. Meanwhile, Quetzalcoatl knew that he’d better move quickly to take the bones and leave. Quetzalcoatl thought of a trick. “Tell the Lord I’ll leave the bones behind,” he said to his spirit twin Xolotl. Accordingly, Xolotl assured the Lord of Mictlán that the bones would be left. Meanwhile Quetzalcoatl began to run. Unfortunately, he fell into the pit the Lord of Mictlán ordered dug, having been startled by a covey of quail. Those bones that weren’t already shattered were pecked at by the quail. Which is why humans come in all sizes. “This has not worked out well,” said Quetzalcoatl to his spirit twin. “What must be must be,” replied the nahual. And so Quetzalcoatl scooped up the bones and, once safely beyond the dead land, ground them up in a bowl. Together with the old goddess Cihuacoatl (Woman Serpent) and other gods, they sprinkled them with their blood, restoring them to life. And thus humankind was born from the penance of the gods themselves. Based on the Myth of the Suns and the Toltec-Chichimec Origins of the Mexica People, as translated by Willard Gingerich, in The Flayed God. by Roberta H. and Peter T. Markman, blended with the variant as told by Cehualli. Have fallen in with Quetzalcoatl and love your work. Retired, living in Mexico 11 years, want tattoo of Quetzalcoatl on forearm. 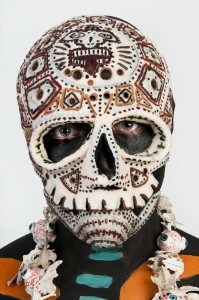 Now looking for most realistic Mayan rendition and obviously you are the man.